The Charity School of Philadelphia owes its existence to the vision and efforts of Reverend George Whitefield. Whitefield himself had benefited from such a school when he had been a lad in England. From his first visit to Philadelphia in 1739, evangelist Whitefield had sought to improve the lot of the poor, especially in regard to education. In 1740 his followers in Philadelphia began the building of a church and charity school in the city, but after Whitefield’s 1746 visit, the popular appeal of evangelism declined. Whitefield’s followers did not have the resources to complete the building. In 1749, when Benjamin Franklin was searching for a site for his proposed Academy, he convinced the trustees to purchase the Whitefield building as the core of the campus. When the deed of sale was signed on February 1, 1750, it included a clause stipulating that the Academy officials maintain on that site a charity school for the children of the poor. 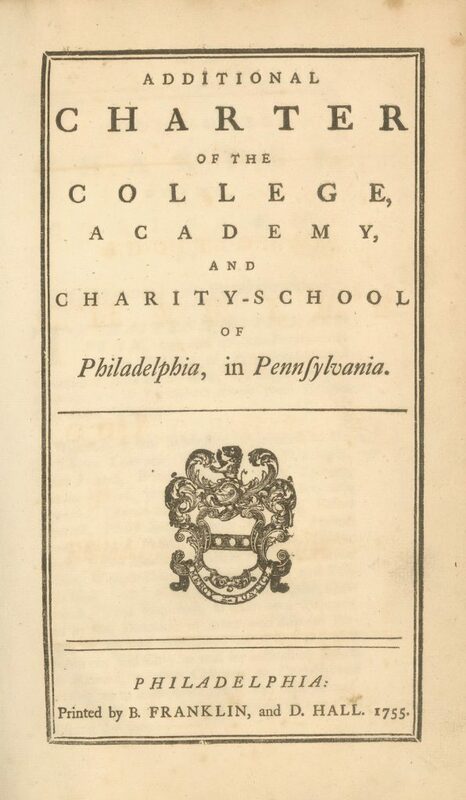 Thus, from its beginning, the Charity School was part of a larger, shared Penn campus. Over the years, the availability of funds determined the size of the enrollment and the hiring of assistants to the headmaster. There was considerable staff turnover. The first boys in the Charity School attended classes in the Academy building, in the classroom to the right of the first floor entry of from Fourth Street. In 1763 a new three-story, brick building, measuring seventy-six by thirty feet, was completed. The upper floors were a dormitory for about fifty students in the College or Academy. The first floor, however, was assigned to the Charity School, housing the upper classes of the boys’ branch. A branch of the Charity School for girls opened in 1753. Trustees Ben Franklin and William Shippen engaged as head mistress Mrs. Frances Holwell, previously a director of a school in Philadelphia. The curriculum was designed to teach reading, sewing and knitting to thirty girls. The Trustees appropriated money for books, canvas and materials for crewel work. In 1761, after Mrs. Holwell’s death, her sister Mrs. Mary Middleton was appointed headmistress; a year later, Mrs. Sarah Gardiner, a niece of Mrs. Middleton, took over that position. Mrs. Gardiner headed the school until 1779; the British occupation interrupted the school briefly, but when the Americans returned, Mrs. Gardiner in 1778 resumed classes in a rented room in a house on Fifth Street near the Dutch Church. From 1779 to 1782, Mrs. Gardiner was succeeded by Mrs. John Heffernan, the wife of a master in the Academy. She was succeeded in turn by Mrs. Martha Davis, Mrs. Mary Robinson and then, from 1796 to 1800, Mrs. Mary Burke. Because of crowding, financial considerations, and concern about the proximity of the girls to the many boys on the campus, the trustees were not always comfortable with the presence of the Charity School for girls on campus. The class of girls, sometimes as many as forty two, was taught in one of the upper rooms of the Academy building until 1758, when their classroom moved to a nearby house. With the opening of the dormitory building in 1763, the Charity School for Girls returned to the campus, occupying space on the first floor. As late as 1764 the girls of the Charity School shared the College Yard with all male students, but later the girls were moved off campus again to a nearby dwelling.